Hi everyone! I’m Michele from The Scrap Shoppe. I’m a former scientist turned full time blogger which allows me to spend more time with my two little boys. My blog focuses on creating fun, creative, and unique craft and DIY projects for the home that anyone can recreate. 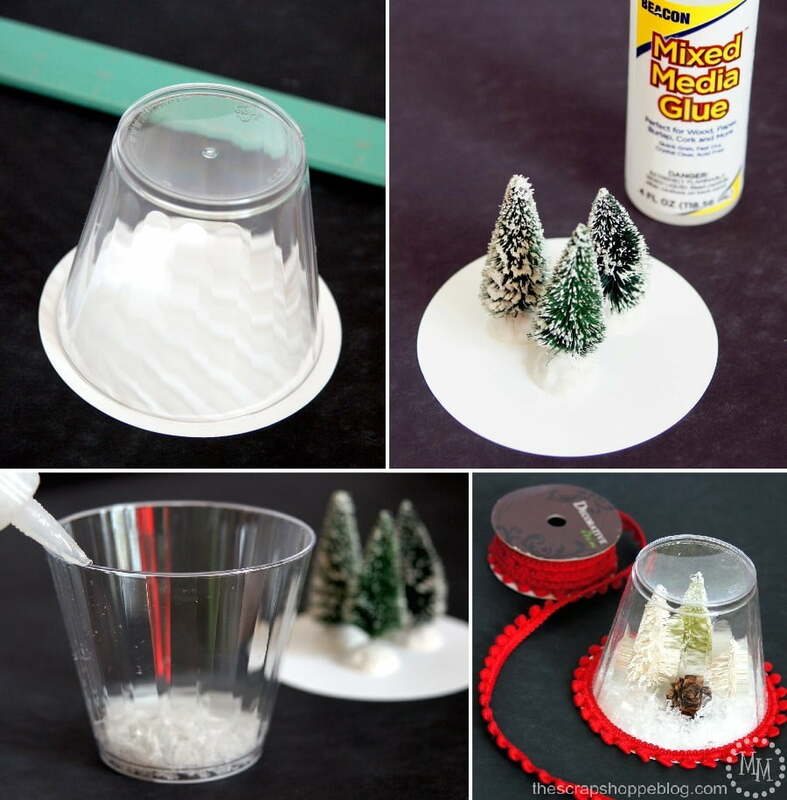 Measure the diameter of the top of the plastic cup and cut a circle out of the cardstock slightly larger than the cup.Glue decorations to the center of the cardstock.Once decorations are 100% dry, add faux snow to the cup and run adhesive along the rim of the cup. Carefully invert cardstock with decorations glued on and place on the cup. 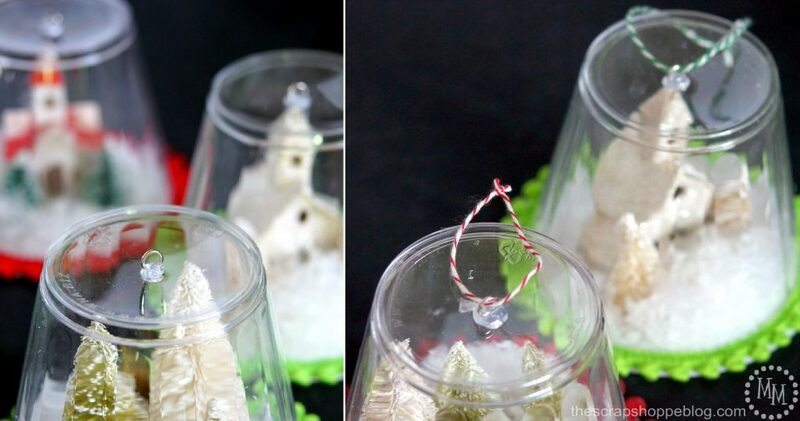 Turn cup upside down and press firmly onto cardstock.Adhere pom pom trim around the edge of the cup. Glue a jump ring to the top center of the cup. 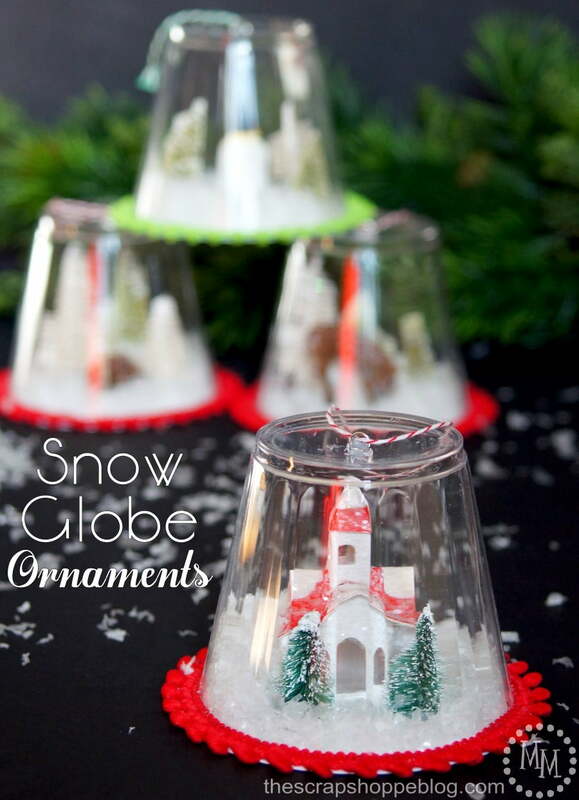 Once dry, add twine and knot into a loop for hanging any decoration small enough to fit under the cup can be used for these snow globes. 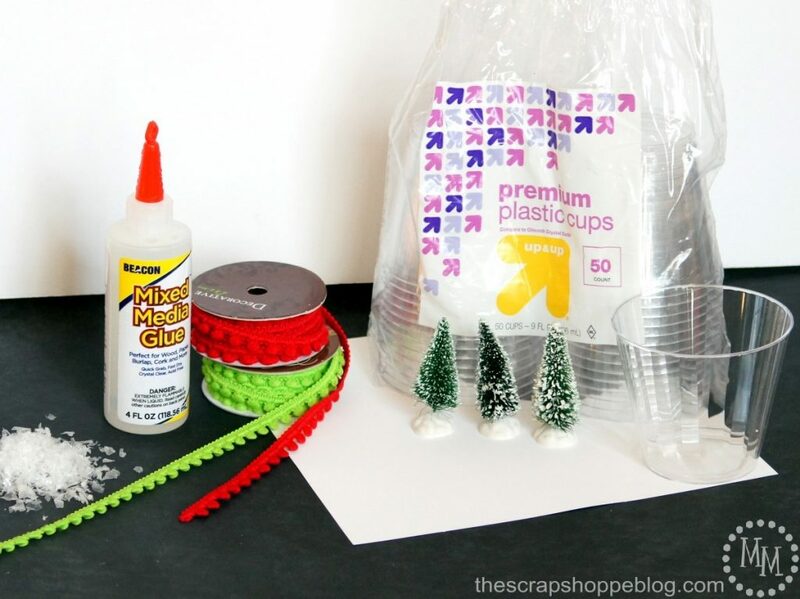 We used mini bottle brush trees, tiny pine cones, little animals, and small church ornaments. I think the boys’ favorite part was adding the snow. They are so proud of their new ornaments! Thanks so much for having me over, Jen! Happy holidays, y’all! I want to make an entire of village of those ornaments. I can’t wait!! Isn’t this little Pom Pom Chalkboard Wreath so happy? I love this Potting Shed Makeover too! These are sweet, but in no way new. My mom used to make and sell them, and she died almost 20 years ago. I still have some that she made. So cute! My girls would love making these. What a great idea! These are SO cute! On my blog I made a post with babysitting ideas, and this would be a great addition! These are adorable! I have seen so many cute little miniatures. These would make fun gift ornaments for the little ones to give, and could be customized for the receiver. Thanks for sharing! Pinning!